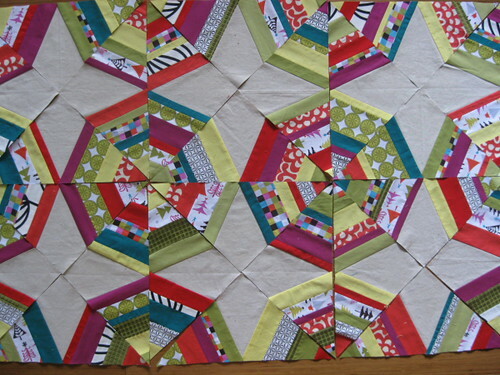 Piecing in the spiderweb block style is surprisingly time consuming! I’ve gained a new admiration to those who have completed a large spiderweb quilt. Good thing my Christmas tree skirt only requires 14 finished blocks! I’m pacing myself at 1 block per night (that’s 4 triangles). After the piecing, the pressing/trimming of that 1 block takes the entire 45 minutes of a show. Well, at least it comes at a good time when I’m short on handwork! I have to say that I believe I’ll continue to favor quick-piece projects. 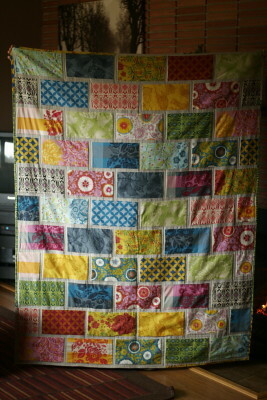 Notice how the 2 large quilts I’ve made have large pieces. I love the rush of beginning a project. I feel satisfied and happy by completing them. The in-between part? Well, it’s kind of blah sometimes! Ok…. YES! You all so absolutely knew I was starting a Christmas tree skirt. Great minds think alike, right? Well, with no suspension left, let’s get to work. 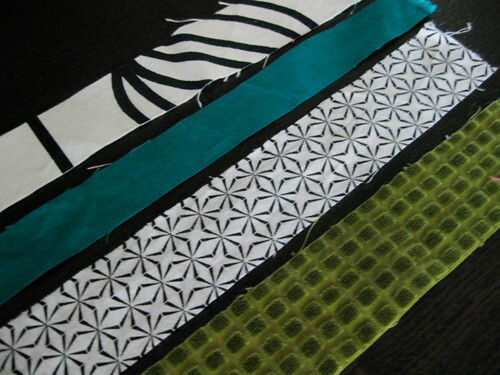 I promptly slashed about 5 inches of each fabric, end to end, to make this pile of strips, ranging from 1-2″ wide. In the morning, the sun fell on it in such a lovely way. 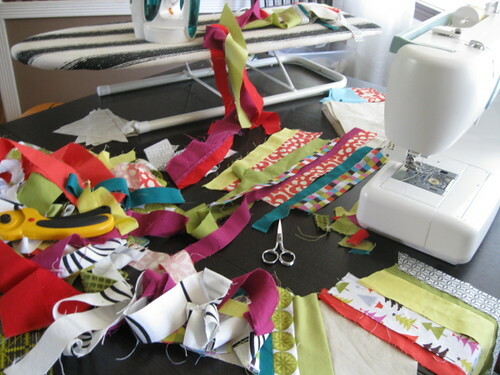 Who knew a pile of scraps could beckon me so? 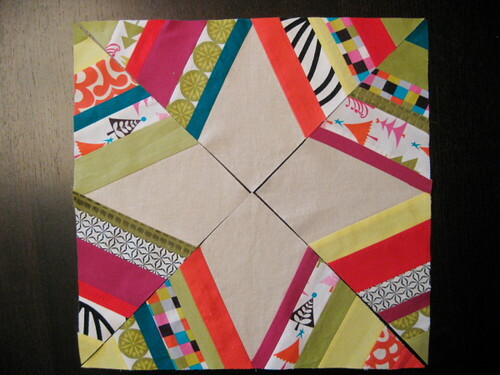 But, when I pieced my very first triangle, I immediately started having second thoughts about that teal. Even though the Christmas spice prints have a tad of teal in them, the solid strip just stood out so much from all of the other warm shades. So, do you think that it works? Please say yes! Sometimes I think it looks a little nutso, but I remind myself that our Christmas decor has the personality of those multi-color vintage Christmas lights. Not very subtle. And, hey, this is very merry, right? In other news, Aria has discovered that she can actually, truly help me with this project by deciding on the order of strips for piecing. I laid down a few rules (or the child would have chosen all prints!) and she was off. I’ve really been sewing a lot of what she lays out, so this is a true collaborate effort. Good memories, I’m sure! 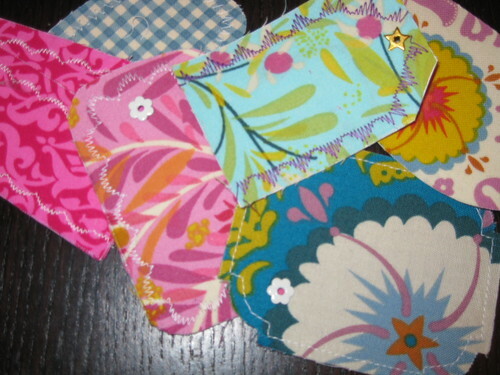 I have a confession: Aria is disappointed that none of these fabrics are designed by Anna Maria Horner. She also hopes to meet the designer when we go to Nashville this month. I suppose that reveals the depths of my affections for Ms. Horner (blush). When we were working together today, Aria was shocked to discover that Anna Maria Horner makes solid fabrics. Imagine THAT! 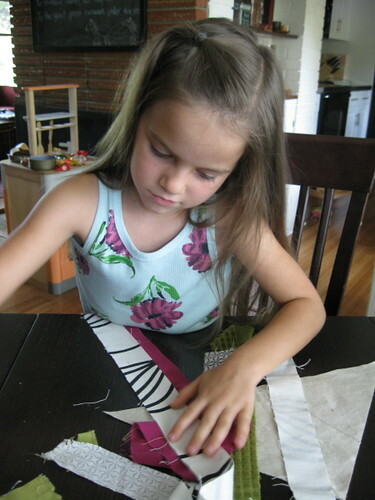 Perhaps that legitimizes my insistence on so many solid fabrics in this project to my little artist-to-be. P.S. The table, is just a little messy. Hurray for starting new projects! Isn’t it such fun? 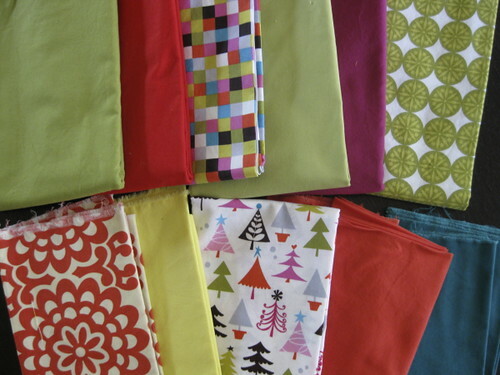 Here are the fabrics I’ve gathered for my next big(ish) project. 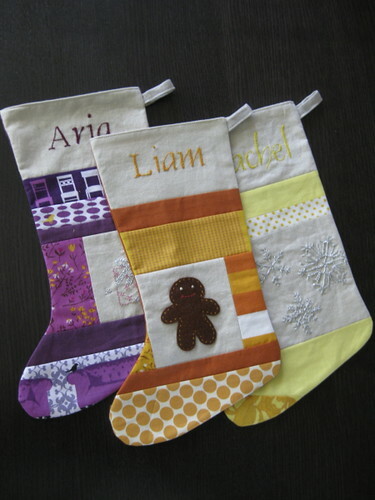 I purchased 3 Christmas prints from Sew Love Christmas, another Etsy store from Ruth of Sew Love Fabrics. They are from Michael Miller’s Christmas Spice collection, in slightly “off” tones of olive green, tomato red, pink and teal. 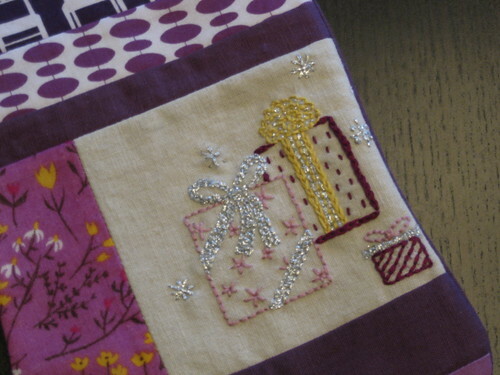 Amazing – A Christmas fabric that fits in with my home! 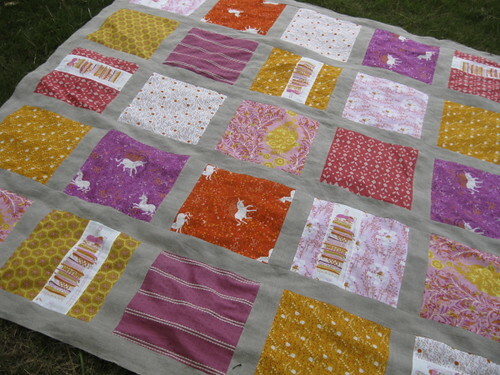 I decided to mix in quite a few solids after seeing this stunning quilt by Dirt Road Quilts. Honestly, I’ve never worked with this many solids and I wonder how it’ll all work out. Added a little Amy Butler wallflower for good measure. 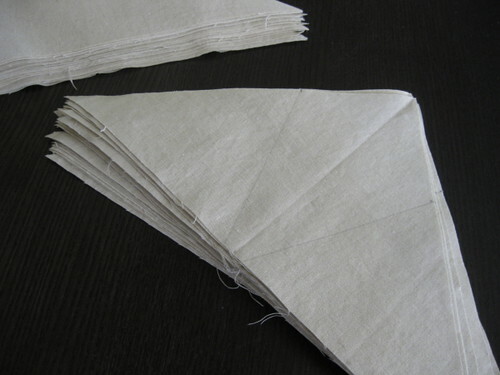 Now I’ve cut fourteen 14″ blocks and divided each into 4 triangles. I’m in the process of marking the triangles to prep my first go at spiderweb blocks. But, I’m not making a quilt. Can you guess what it’s to be? I’ll admit, I’m just a leeeetle excited about this one! Here they are folks, all in a row. So fun to make. So much about COLOR! I think I saved making Brandon’s for last because there were… well, rules. No flower prints, no extravagant “froo-froo” embroidery, only manly shades of green to be permitted. I did sneak in a few sparkly silver snowflakes, because the forest scene was just toooooo simple. Actually, I embroidered those while we watched a show together. 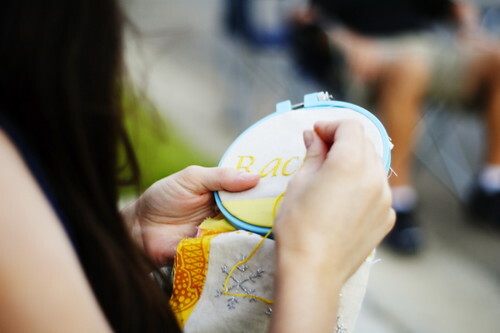 He kept glancing back at my stitches with a funny look on his fact, so I stopped myself at three! I was so relieved when the little loopy thing came together on the first try again. Apparently, I am learning folks! 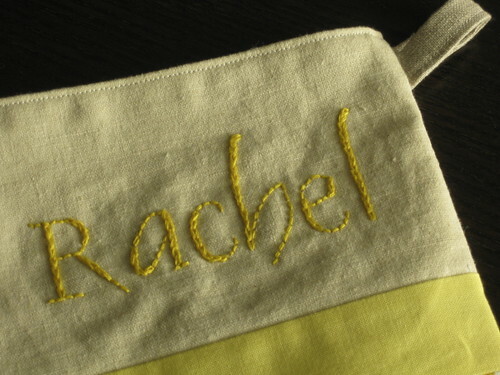 Oh, and I think my embroidery in the Dauphin script improved as time went by. Sometime I’m going to have to show you my first attempt at embroidering this script. I-yi-yi! So that’s it. 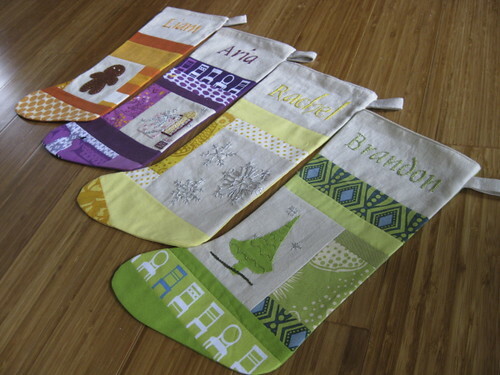 Our patchwork Christmas stockings are done and packed away now for a few months, which gives me some time to figure out how I’m going to hang them over our mantle. 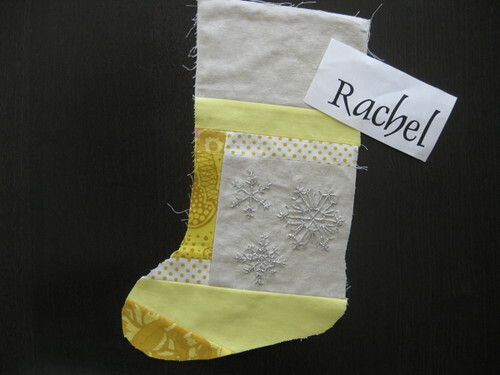 Last night I finished another patchwork Christmas stocking. 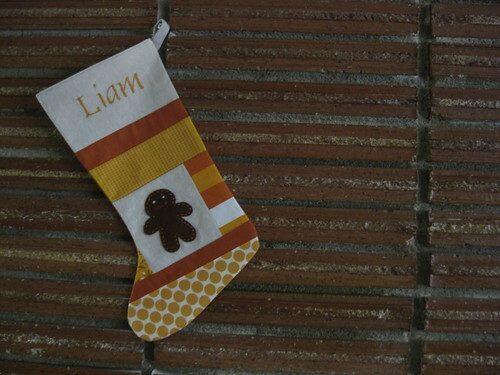 Here’s the little gingerbread boy. 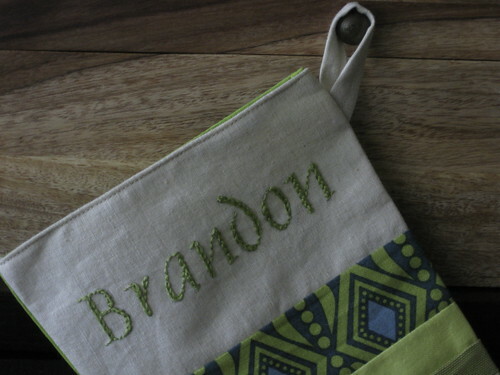 And, drumroll please…., when I sewed the little hangy loopy thing, I got it right the FIRST time. Oh, yes, it’s the little things :). One more to do and we’ll be complete. 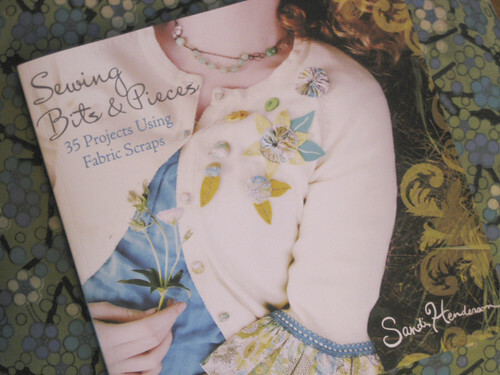 But, tonight I don’t feel like sewing. I feel like reading. I browsed at the library for at least 30 minutes today trying to find the right book. Nothing. Now, after doing some looking online, I have 2 good ones on request. So, I guess it’s the couch for me tonight. I’ll be posting an update on the hand quilting soon! Oh, I so wish you could have been here last night! A group of 8 super fun ladies met at my house for a crafty social of sorts. Cookies + Crafts + Friends = a Perfect Night! So, what did we do? 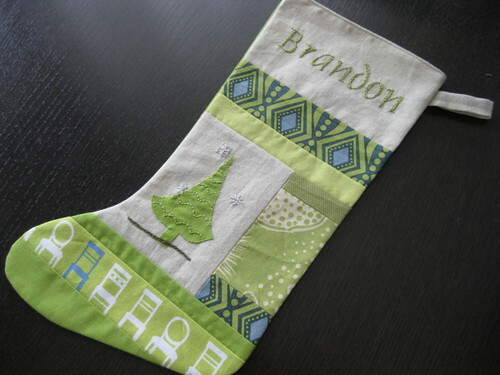 Fabric gift tags – an easy, instant-gratification project from Sandi Henderson’s Sewing Bits and Pieces. Following Sandi’s instructions, we layered cardstock, then plastic wrap, then fabric and used a dry iron set on high to melt them together. Once fused, simply cut into desired tag shapes, add decorative stitches and finish with a scrapbooking brad (also called an eyelet). 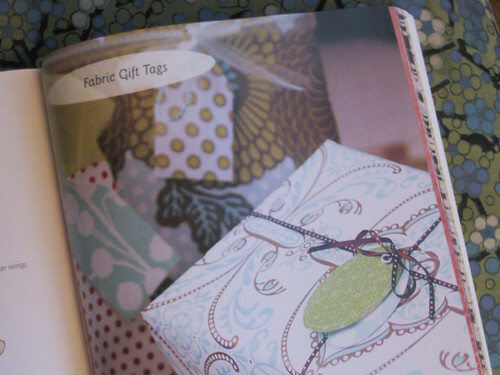 To use, write any message on the cardstock side of the tag. 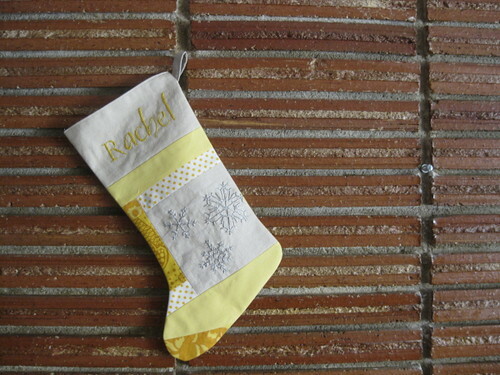 The eyelet is for tying the tag to your gift. Although we used 2 different types of plastic wrap, we couldn’t seem to make a permanent fuse. So, it turns out that the decorative stitching was more necessary than optional. 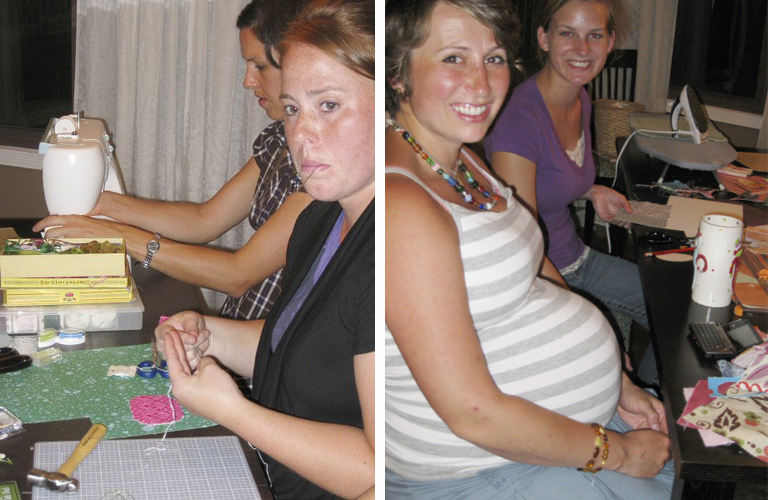 That’s ok, it got some of our no-sew ladies a bit more friendly with the sewing machine! Hand stitching with embroidery floss was a very nice option too. If I were to do this project again, I’d buy a product designed to fuse, rather than using the plastic wrap. Here are a few of mine. 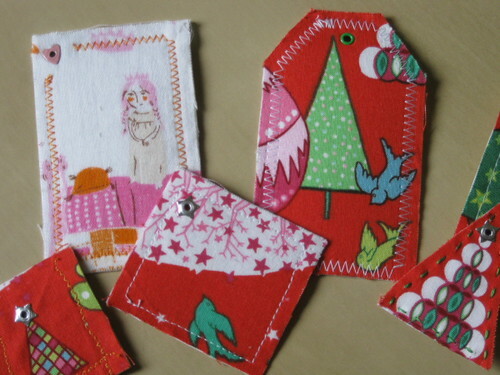 I was going mostly for Christmas tags, since that seems to be a theme with me lately. 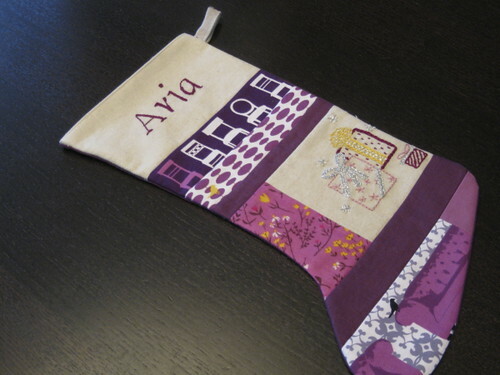 This fabric is one I received in a Holiday Scrap Pack from Sew Love Fabrics. With all the fun graphics, it was perfect for tag-making, don’t you think? 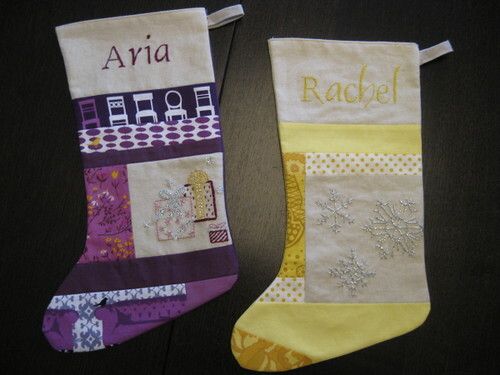 Check out these tags made by my friend Hannah! She blew us away with her creativity and productivity. I think she made like 20 tags! 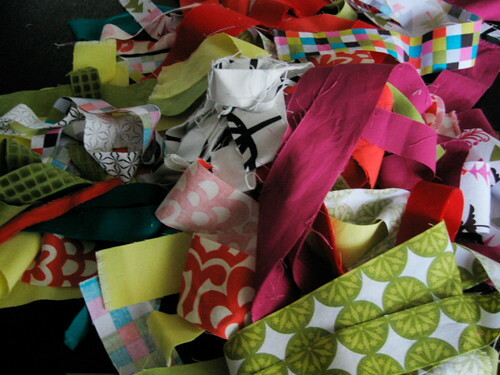 And more than half of them were from my scraps of Anna Maria Horner’s Good Folks collection. Kindred spirits, Hannah and I. Anyhoo, as the night wound down she broke out the colored thread and used every one of my machine’s fun stitches to finish her tags with lots of personality. I wish you could see them all. Aaaah, good times! Now I’ve got to keep my eye out for another easy project for crafty social take 2 sometime this fall.